Tuition costs are a big part of planning for college – and a big concern. 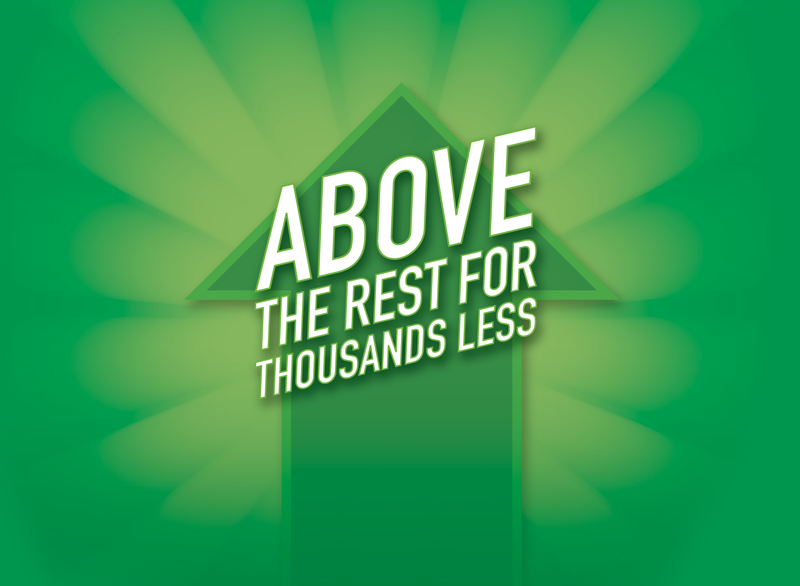 UNT offers you an innovative solution to rising college costs with the Eagle Express plan. Eagle Express is more than a tuition plan, it’s a plan for success. UNT’s Eagle Express plan locks in your total academic costs for four years. It pays to graduate on time. Save up to $3,000 in your last 15 hours (typically your last semester) by graduating in four years, and you may also qualify for the statewide tuition rebate of $1,000. You’ll save time and money by knowing your academic costs up front, graduating on time and earning a full-time salary sooner. Already enrolled in Eagle Express? Review both tuition plans available to you. Opt in to the Eagle Express plan. Complete your bachelor's degree in four years. Save up to $3,000 the semester you graduate! The Eagle Express plan is available to all new freshmen and transfer students entering UNT. You must meet Texas residency requirements and be seeking a bachelor’s degree. If you do not meet the Texas residency requirements, you will be automatically enrolled in the traditional tuition plan. If you choose not to opt in to the Eagle Express plan, you will be automatically enrolled in the traditional tuition plan. You’ll save up to $3,000 if you graduate on time. You’ll know your total academic costs for four years, helping you plan expenses. Course/instructional fees are included in the locked-in amount. You’ll graduate with less debt. You'll get the best of both worlds – the best bachelor's degree experience in Texas at an affordable price. You’ll get a head start on your career sooner – whether you want to land a full-time job or continue on to graduate school. The Eagle Express graduation incentive is based on how many hours you complete at UNT. Any college credit hours you earned before high school graduation do not count against new freshmen. For example, if you’re a high school graduate with 40 AP and/or dual credit hours, you would still be eligible for the $3,000 graduation incentive – which is a fabulous deal. *Total Academic Cost is based on taking 15 semester hours in the fall semester and 15 semester hours in the spring semester. **In your final 15 semester credit hours, the Eagle Express plan will save you $3,000. With the $1,000 tuition rebate, you could save up to $4,000. Taking courses in the summer rather than the long semesters will result in a higher total cost. 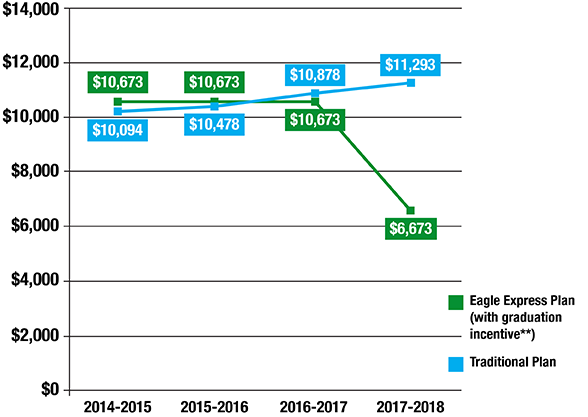 If you choose the Eagle Express plan and do not graduate on time, you’ll end up paying about the same as you would under the traditional tuition plan despite losing the graduation incentive. The choice is yours! If you decide the Eagle Express plan is the perfect fit for you, call 844-236-6855 for details on how and when to choose Eagle Express. At Freshman Orientation, you’ll hear more about the tuition plans. You also can direct any questions you have to our toll-free information line at 844-236-6855. Want answers now? Visit the Eagle Express FAQs section for more information on how it pays to graduate on time at UNT.